In the last shot I wanted the hero to get really close to the floating pyramid as his journey was coming to end (or maybe beginning, if I made it into a full short). 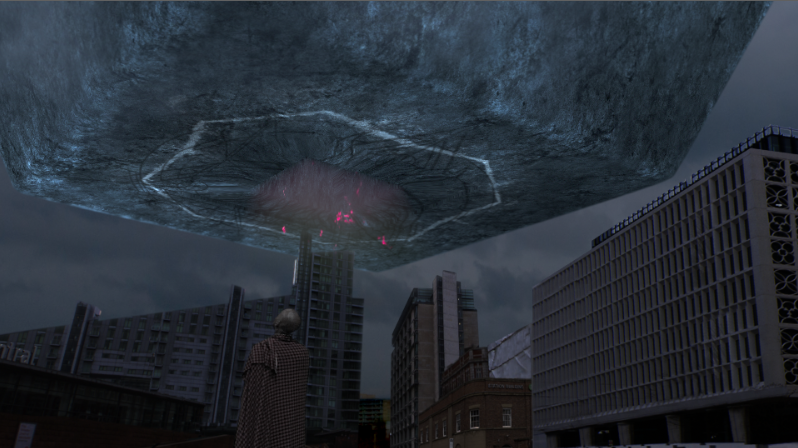 As this was happening in a city where was no sign of other humans I cleaned up the photograph I took in a daylight, removed people and cloned some areas which would look weird when projected. When I started this shot, I just used a printscreen from my footage as a reference image attached to my projection camera, thinking, that I can used the modelled scene with my high-res photograph of the same view. When I realised this mistake, I swapped for the high-res photo, but noticed the huge lens distortion. Surprisingly it wasn’t present on the footage, but only on the photograph. 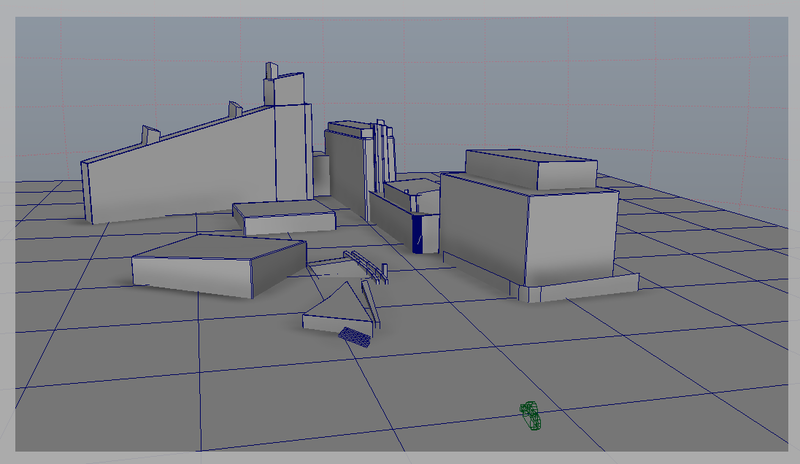 After undistorting the photo, I started modelling again but I struggled with the perspective/focal lenght. I forgot to convert my crop sensor camera values to a 35mm film camera. The distortion was still present, but I could still work with it. 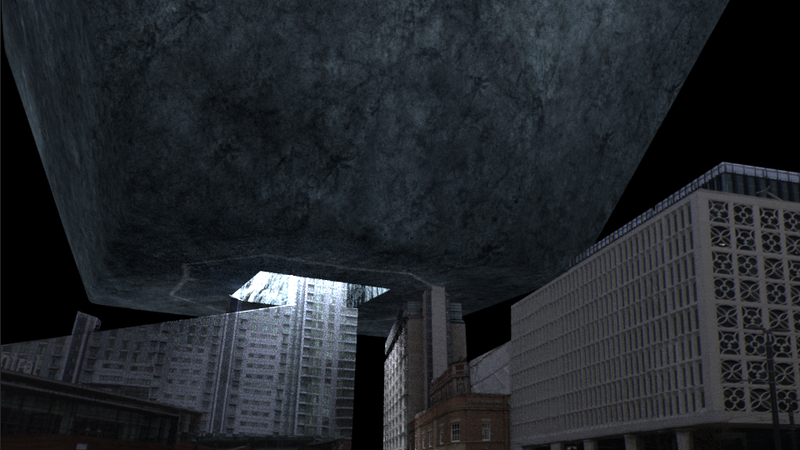 Finally modelled the scene and it nicely worked with the projection in Maya. Unfortunately it didn’t line up in Nuke for some reason. 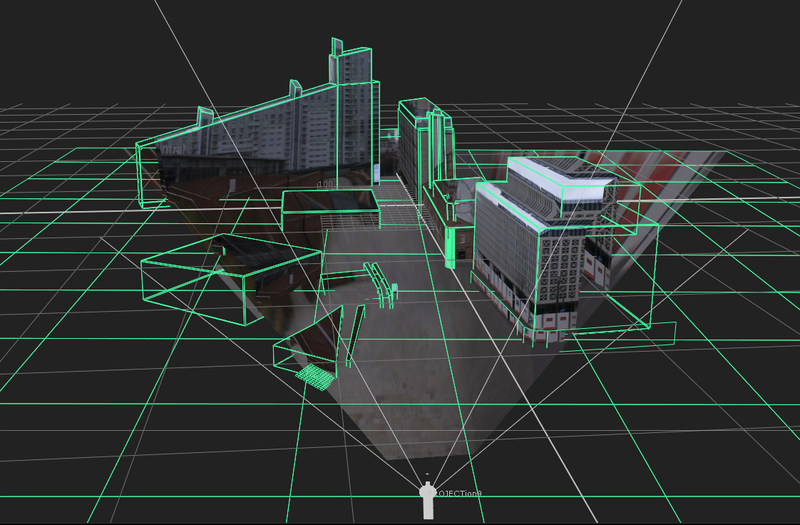 Since I was running out of time, I animated a camera in Maya and rendered out the buildings and the floor in separate render layers. In Nuke I composited everything in 2D for this shot. 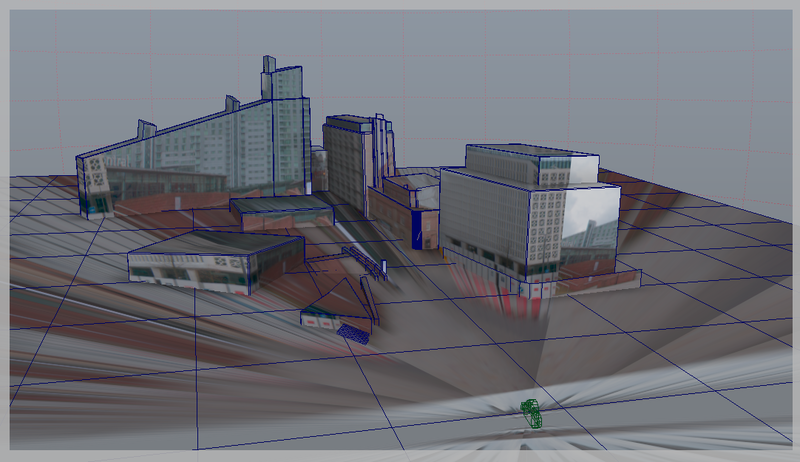 First bringing in the buildings and layering them in the correct order. I softened the edges of the buildings and blurred them with Defocus. The first building on the right had some railing with the sky still baked in, so instead of going back to Photoshop and removing it, I used a luminance keyer and removed those bits from the existing alpha. I also added a small amount of Lightwrap to add rim light to the buildings at the back as they will be illuminated by the pyramid. 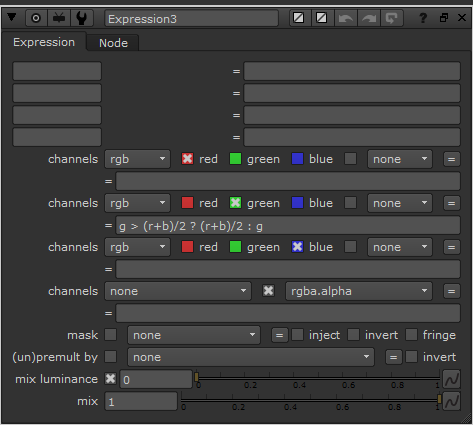 Opacity controlled with the merge nodes. Sky was made up by blending the skies from the previous shot and finished with a grade for darkening. For this close up shot of the pyramid, I had to do more work on the textures as the original ones were only 1-2k. 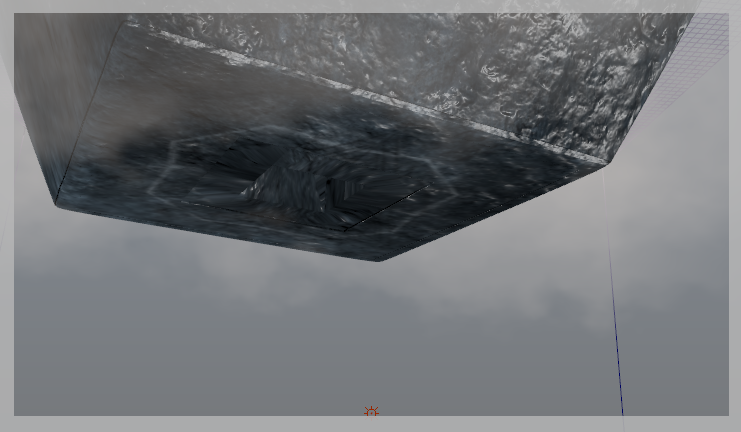 I also decided to add the fog/low clouds in the render using Maya Fluids. Could have done it with a depth pass, but at this stage, the time was really pressing. Rendered using Viewport 2.0 with no hassle except I couldn’t get the normal maps rendered. Also the light from the pyramid that illuminated the buildings very nicely had to be dropped of due long render times, but I would have definitely go for it if I had more time. Next to comp in was the actor. Key pulled using the same setup as in the previous shots as I used the same, diffused lighting throughout the whole project. I reduced the spill using an expression to suppress the greens. Colorgraded according to the average color tones and darkened to an evening time. As I didn’t render in Arnold and didn’t get the nice lighting over the building, I filled the hole on the pyramid, separated it and rendered on it’s own. 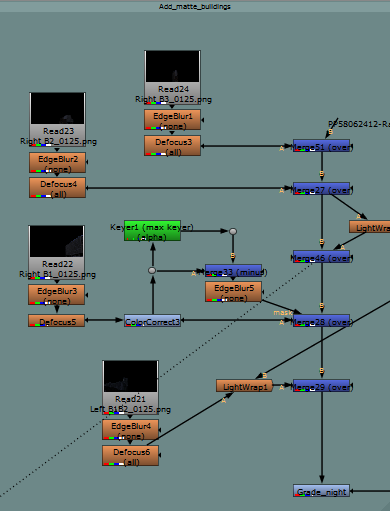 Then I used this sequence as an alpha for generating animated GodRays. I was still missing some movement in the shot, so I looked for free stock footage of ambers. I converted one into sequence, scaled, color corrected, slowed down with an OFlow node and masked with a roto in combination with the GodRays I used as an opacity mask.